A black conservative warned black Americans that more white terrorists may be encouraged to take up arms against them after the Charleston massacre – if President Barack Obama continues to say racism is an ongoing problem. 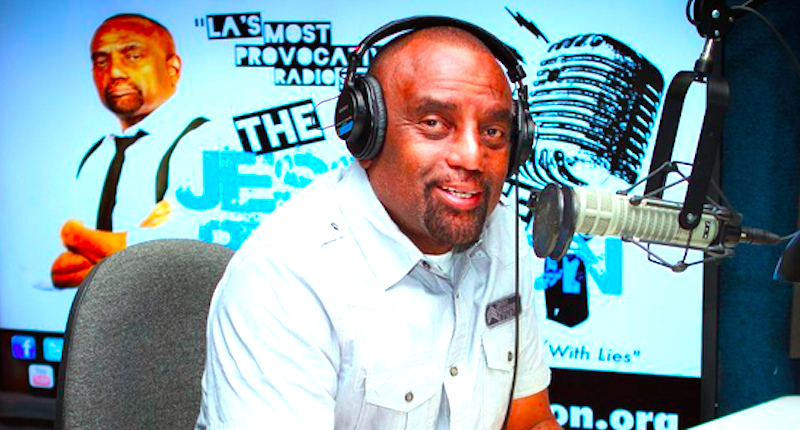 Jesse Lee Peterson, a frequent Fox News guest, appeared Thursday on Steve Malzberg’s Newsmax TV program to discuss the fatal shootings of nine black worshipers by an apparent white supremacist at a historic South Carolina church, reported Right Wing Watch. The conservative pundit, who recently told Sean Hannity that Baltimore residents had overreacted to the death of Freddie Gray while in police custody, insisted that white racism against blacks no longer existed. He urged angry white people to start lashing out against black critics by reciting racist tropes. “They need to speak out to the country, to black Americans, and tell them, ‘I am not a racist, I am not your problem — you need to take care of your own life, you need to get married, raise your own children, get away from the government taking care of you, (and) drop your anger so you can see that I am not your problem,’” said Peterson, summing up a month’s worth of Fox News programming in a matter of seconds. He said a “lack of moral character,” not racism, was to blame for racial disparities in the U.S. – but he said white Americans were victims of a racist double standard that would eventually lead to even more violence against blacks.